● Click the Tab Above ⇑ Planning Design & Installation Tips along with the Video Tab to Learn More. To begin the process of sizing your solar system you first need to pull your most recent 12 months utility bills and record the kWh from each month. Add the most current 12 month kWh then divide by 365 to get to a daily average. This number is the basis for all the design questions & answers after that. Click on the sub-tab above ⇑ "Planning Design & Installation Tips" to learn more. 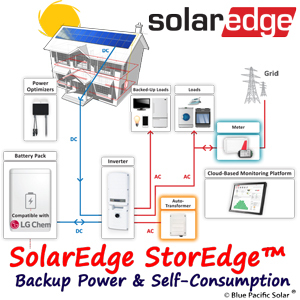 SolarEdge’s StorEdge battery storage solution automatically provides property or business owners with backup power in case of grid interruption for critical load and allows owners to maximize self-consumption. This is becoming increasingly more important as the highly solar saturated zones are sometimes restricted to export power by local utility companies to prevent destabilization of the local utility grid. 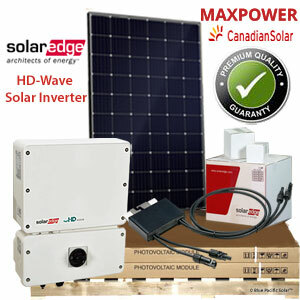 The SolarEdge StorEdge™ single phase inverter supports grid-tied applications and backup power, manages the battery and the system energy, in addition to its traditional functionality as a panel level DC-optimized solar inverter. Is Battery Backup Really Necessary? Just because something can be done doesn't necessarily mean that it needs to be done. A battery backup element is going to add to the cost of a solar system, so you should make sure that it's worth it. The cost for a modest (approximately 4kW) sealed battery pack that will keep a typical family home running in emergency mode with minimal critial load power will start at between $9,000 - $14,500. That price quickly rises as the size increases. The hard-nosed financial question, is it worth the cost of a battery backup to keep the lights on during an occasional garden-variety power outage that lasts just a few hours. If not, we heartily recommend the standard blackout kit: A candle, a bottle of wine and a friend. You'll be fine. Zombie Apocalypse or Just A Few Days of Power? Here is Where You Start. A load analysis, which is a detailed list of everything you expect to power in your home during a blackout, is a critical part of your backup design. For each load, the expected power consumption and hours of use are listed and totaled for one day. There are no one-size-fits-all solution for backup power systems. 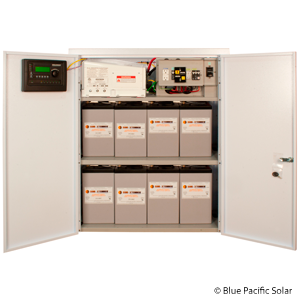 Each emergency solar backup system is uniquely designed to its site, loads, budget, and the personal lifestyle of the homes occupants. OK, with that out of the way, we have some work to do before you can select the right emergency solar backup power system. To begin the process of sizing your solar system you first need to pull your most recent 12 months utility bills and record the kWh from each month. Then take the total of the 12 months kWh then ÷ by 365 to get your daily average usage. This number is critical to begin the process for a grid-tie system. Don't have 12 months worth of history? Then average what you do have or if you are moving into a different house use the bills from your current home to get an idea of your energy usage. You can usually find the kWh near the top of the first page of you utility bills. An alternative method would be to go on line and down load the information or call your local utility company to find out your most recent 12 months total. Sizing an emergency backup system for your home begins with a goal that is personal to your home, your lifestyle, motivation and budget. Start by asking yourself a few simple questions. How often does the utility power go down at my home and how long do the power outages last. For my lifestyle, what is important for my family to have access to when the grid goes down? Refrigerator? Well pump? Sump Pump? Lighting? Now ask yourself what is my budget for accomplishing my goals? Get some general ideas on what you want to power and how much you want to spend? We talk to hundreds of people a day across the country and often the first thing we hear when we say we need to see how much sun is available in their area is "we have lots of sun so that should not be a problem". The fact is that when sizing a kit, it is not how much sun you have, it is how much sun strikes the earth in your zip code which can sometimes surprise customers. Little considered factors such an high humidity and elevation can play a key role. Example; most of Texas and Florida have latitudes that are farther south than Arizona but have less "sun-hours per day" because Texas and Florida have higher humidity levels and more cloud cover. The 2nd step in the design process is to look and see what the average amount of solar irradiance is available near your area from our resource map. Find the nearest city to your home and write down the average "sun-hours per day". Mounting your system on the roof, ground or top of a pole; budget, roof dimensions, ground space or setbacks, shading and other site-specific factors call for careful consideration in your design. Compare the sizing results from your calculations in steps 1, 2 and 3 with the location and amount of space available to mount the solar array in order to get a rough idea of the maximum of panels. If you are planning to mount your array on a roof, decide which module best fits into the available roof space, taking into consideration obstructions such as chimneys, plumbing vents and skylights. Many local building codes will not allow a solar system to extend beyond the perimeter of the outside of the house footprint. (You may not be able to utilize your roof overhang or eaves.) A good place to start is to check with your local building department to see what their setback rules are for either a roof or ground mount array. How many panels will fit? Rule of thumb; ≈ 100 sq. feet of area per 1kW of solar. Shading of array location. No well-planned installation should have a shading problem around noon. Heavily or regularly shaded panels (even when operated with a micro inverter) are NOT worth the investment! Avoid shading as much as possible. You will want to consider potential shading from trees, buildings, power lines, telephone poles, and obstructions like chimneys and vent pipes. TIP; Avoid Vent Pipe Shading. Keep solar panels away from objects protruding from your roof by 3X the objects height. Maximum efficiency vs. maximum energy. Fixed arrays tilted to the angle of your locations latitude will generate the highest year round efficiency. However, largely because of aesthetics, most people would choose flush mount arrays slightly raised off of pitched roofs for the majority of home installations. Raising the panels off the roof about 4 - 6" will allow for ventilation behind the panels. Solar cells produce less electricity as they heat up. Top-of-pole mount kits are sometimes great option when you have the ground space and additional budget because you can usually orient the panels facing true south and adjust the tilt several times a year to achieve a maximum solar energy harvest. Roof type and age. If you plan on re-roofing within 5 years but are not ready yet, some homeowners will replace only the shingles located under the solar array when the panels are installed and leave the rest for later. Inverter Location. Solar cells are activated by visible light not ultra-violet or infra-red. Solar panels produce electricity when exposed to sun light, but plan to keep your inverter (s) in the shade. Inverters work better when located in shaded well ventilated areas. For grid-tie inverters we sell, they can be mounted outdoors or indoors. But either location your choose, shaded well ventilated areas are best. TIP; Mount your solar panels with at least a 7 degree tilt to avoid "Mud Shading". That's when dirty water washed off the solar panels accumulates across the bottom cells of the panel dammed by the panel frame. When the water dries, the dirt or mud builds up across the bottom which can shade the entire row of lower solar cells on each solar panel. In most areas of the country you will be required to enter into a "interconnect agreement" with your local utility company. This is a simple form that lets them know you will be producing some of your electricity at your location and the equpment you are proposing is UL listed and approved. Just go to your local utility website to download the document or call your local utility customer service line and have them send one to you. Wire carries electricity in much the same way as a garden hose carries water. When you turn on a breaker, a electron flows in one direction and knocks another electron which knocks another one until eventually an electron comes out the other end. Voltage is the electrical pressure behind the flow of current or electrons. Current, which is measured in amps, is the measure of quantity of electrons flowing through a wire. The higher the voltage the more current the source can produce. Watts are the measure of power. Volts X Amps = Watts. Current can be increased by increasing the voltage or by lowering the resistance (IE: Size of Wire or Conductor). Resistance is the inherent physical opposite to current flow. A good analogy would be to think of it as a dam holding back water. Resistance is created by electrons refusing to be stripped of their atoms and bumped or sent down the wire. The higher the resistance in the wire, the less current will flow. The only way to overcome that resistance, is to increase the pressure (volts) or decrease the resistance (Larger Wire). National Electrical Code (NEC) 690.64 does not specifically require an AC disconnect however, many if not most utility companies like to have a lockable blade disconnect to protect line workers and fire department officials. An AC disconnect is more likely to be required if the inverter is not close to the main service panel. If an AC disconnect is required, is should not need to be fused unless it is the primary disconnect for the line side connection. Arrh... power baby, make that meter turn backwards! This is where it all comes together. Your homes main service panel is the heart of your electrical system and how we connect the solar system to this panel using what option is the key to everything we have done so far in the design planning. Load side connection occurs on the load side of the Main Service Disconnect Breakers via a breaker on the Main Service Panel Busbar. Line side connection occurs between the Utility Meter the Main Service Disconnect Breaker. One alternative to consider without having to replace your main breaker panel would be to decrease the size of the main buss bar. By lowering a 200 amp main breaker to 150 amps may bring your in compliance if you have to go to a 60 amp backfeed breaker for your solar system. However, before you do that a careful study by a licensed electrician should be conducted to make sure you will not stress the breaker with your existing loads. On a grid-tie solar system when the utility goes down, the solar system will also go down. What many homeowners fail to realize when they purchase a standard grid tied system is when the grid goes down, so does the power being produced by the solar panels. Why? The IEEE-1547 standard requires that grid-tie inverters cease to export power (Means your meter spinning backwards) if the voltage measured at the Point of Common Coupling (PCC) (That mean your homes electric service meter) exceeds +10% or -12% of nominal. If that were not the case, there could be a utility worker in front of your home who thinks the electricity is off and become injured. Another alternative is to consider a line side connection. A line side connection or supply-side connections means the connection between the utility company meter and your main breaker box. If you have no room in your existing service panel to add your solar system, see if the number of breakers in your main breaker box can be reduced or consider upgrading the service panel. A line side connection requires a fused blade AC disconnect. If that is required and the solar kit you select states that we will supply the AC disconnect, we will provide the upgrade to a fused AC 60 amp disconnect at no additional cost to you. You should not be overly concerned with how or what type of final connection, wire and breaker size because we do the heavy lifting for you. When you make a purchase over $1,000 for a kit, your order gets assigned to your own personal Solar Consultant. Our System Integrators provide polished technical advice on the design and execution of all types of installations. This single point of contact, who is already familiar with your project, is your free life line to answer your questions and help walk you through any obstacles you might incur during the process. Included with your grid tie package is a full "Instructive Three-Line Diagram of Entire DC Circuit, as Well as AC Lines to Your Metered Service Entrance". 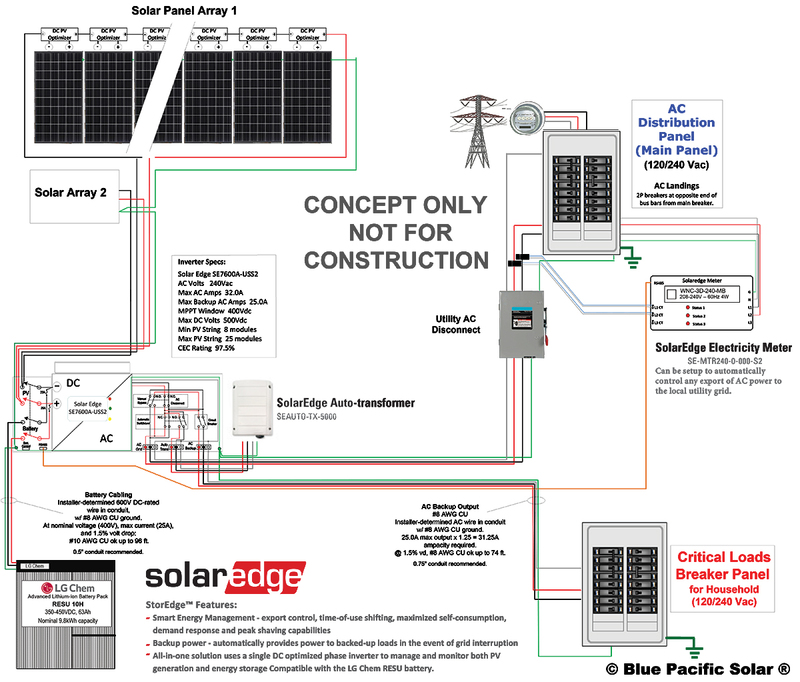 When you buy a grid-tie kit from Blue Pacific Solar, we supply a custom electrical line drawing that shows you exactly how to connect everything. We will specify on our drawing what size and type of wire and breaker you will need to be NEC code compliant. The line drawing can be used for your interconnect agreement application with your local utility company and for your permit with the local authority having jurisdiction commonly referred to as AHJ (Building Department). If you need help with your full permit documents for your local AHJ anywhere in the country, our permit document service is available to help take the hassle out of your solar purchase. We often get asked about running wiring in the attics and if it has to be in conduit. With NEC 2011 (National Electric Code), this just got easier. While the industry has rightly focused on 690.11 Arc Fault Circuit Protection, there was a lesser known change regarding running DC wiring inside the building. Section 690.31(E) changed the requirements for running DC inside of a building to enable the use of Metal-clad cable for DC solar source or output circuits. The Metal clad cable needs to comply with 250.118(10) but will enable customers installing wiring an easier alternative to bending conduit in tight spaces. StorEdge is SolarEdge’s all-in-one solution that uses a single on-grid DC optimized inverter to manage and monitor both solar generation and energy storage. Homeowners are automatically provided with backup power in the event of grid interruption to power pre-selected loads. Solar energy can be stored in a battery for on-grid applications such as meeting export limitations, offering demand response and peak shaving, and performing time of use shifting for reduced electric bills. Manufactured in Israel & Canada; UL Certified, TUV, IEC, ETL Approved. 25 Year Panel & Power Optimizer Warranty. Even a small amount of shade is a bad thing. When a solar panel is even slightly shaded, it is severely impacted. For example, the module shown to the right has 2% of its cell area shaded. The power output of the panel is reduced by 33%, a 17:1 impact factor! This is true even if a microinverter or power-optimizer is used. Squeeze every watt of power out of your solar system. Look out for even small shade factors like overhead power lines or vent pipes in roofs. 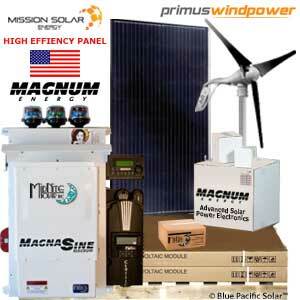 The MidNite Magnum 10.7 kW Home or Business Backup Power kit can be used for modest backup power applications in a permanent location that normally uses utility power, such as a home or office. When utility power is available, the inverter keeps the batteries charged. When the utility power fails, the inverter comes on automatically to supply AC power to your home or office backup load panel during the power failure. For a home or business, reliable backup power is needed to prevent lost computer data, or to maintain lights and keep food fresh in the refrigerator/freezer. We supply the items on the detail pages listed "What's On The Truck". 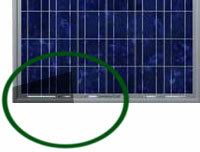 The solar kit takes the PV wire to the edge of the array (Or Sub-Array) where the transition is usually made to conduit. Here are some additional items that you may need from your local hardware store. The remaining balance of system (BOS) components can be; Conduit, appropriately sized electrical wire from the array, some fasteners, sealant, grounding rod, junction box at the edge of the array where you will make the transition to conduit, an AC combiner box if you have more than one string and a AC disconnect within 10' of the main panel which may be required in some local jurisdictions. No worries on the sizing and type of wire because we specify the size and type of wire with the line drawing supplied with each kit. These items are readily available at your local hardware store. How much can you expect to spend? That depends on the size of the system and other individual site specific variances, but we consistently hear from customers for a 3kW - 5kW kit is about $250 - $300 for these locally sourced hardware components. The custom line drawing we supply with each kit is a full instructive three-line diagram of entire DC circuit, as well as AC lines to your metered service entrance. Line drawing questions or just stuck? No worries we have your back and will be here to help whenever you have questions about your purchased kit or plans. For orders larger than $2,000.00 a Technical Sales Team Group Captain will be assigned your account. Your Technical Advisors job is to coordinate all parts and pieces of your order and to work with you throughout the process. This support helps because we will be providing you with a single contact point to call with your questions. Your technical support contact does not replace the maufactures warranty technical support. DIY means you accept the responsiblity of reading and following the plans and other installation documents prior to tackling the installation. SAFETY WARNING: Danger to life due to high voltages. Risk of death or serious injury due to electric shock. Always employ the services of a licensed local electrician or other properly trained and qualified persons to complete final connections.